this keycaps looks like good image. ! Also gonna investigate the GIT logo situation, will send an E-Mail to them tomorrow. The git logo has Creative commons Attribution 3.0 Unported licence. You just have to include a credit and (I think) a URI to original creator for the creation of the logo for that keycap when you distribute it. 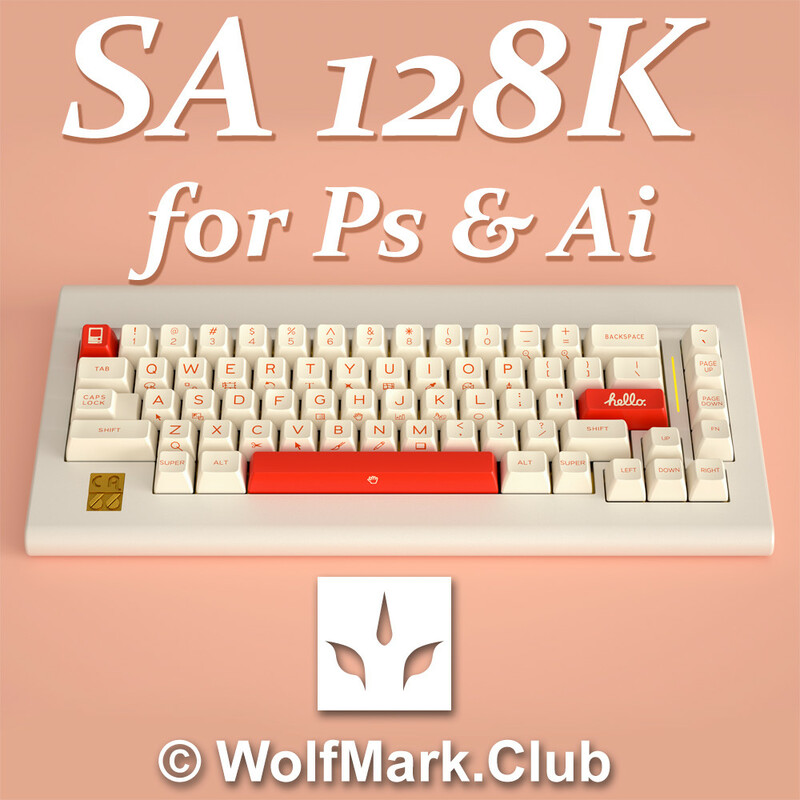 - FUNCTION instead of CONTROL as the CAPS LOCK alternative in the regular modifier kits. CONTROL I find doesn't work as good since it's short form CTRL has different functionality than what that key would be used for. - I've decided to split the Numpad after all. I received pricing from SP and my previous argument of how combining order numbers for a better MOQ drop point that would make it just as cheap doesn't hold up with the drop points they have given me. Naming is subject to change, 'Numpad Quarry' and 'Numpad Hagoromo' felt a bit long, calc.exe v1 and calc.exe v2 too abstract and rather confusing. Suggestions welcome! The project website is coming along nicely, hope to be able to share that one soon, though there is nothing new there, just an easier format for looking at the set and sharing with friends and others. Lastly, I'm looking to order the color chips very soon. 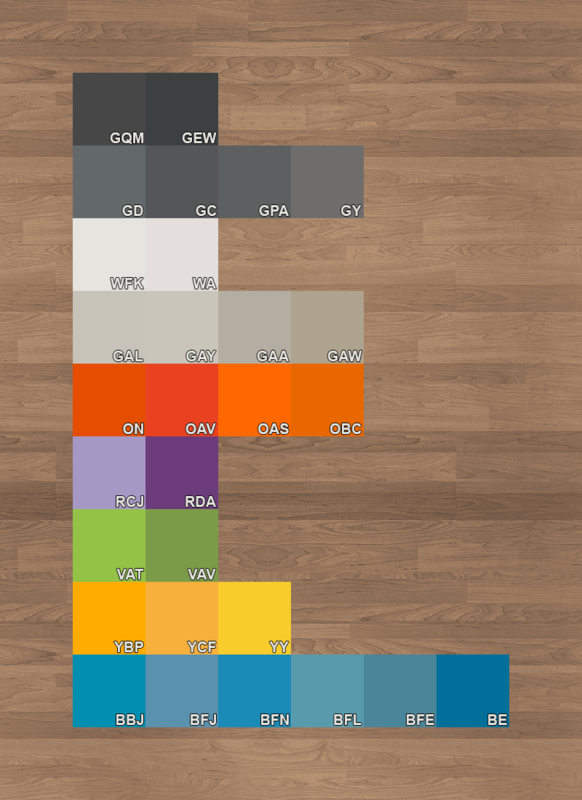 I've compiled a list of alternative colors that I want to check out in real life, YY and RDA are highly unlikely to be actual candidates though, but there aren't many shades for those colors and I wanted to get more than just one for those, you never know. If you have any suggestions, speak now or forever hold your peace. Unless someone donates more after this order, I don't feel like paying 15$ shipping, 2-3 weeks wait time and custom fees a second time I'm looking at a 70 euro bill as it already is. The first in the lines are the current candidates I have listed so far. will there be also a white ISO addon? Voted. Really love the Ergodox kit. This really is a great looking set with the potential to become a true classic. 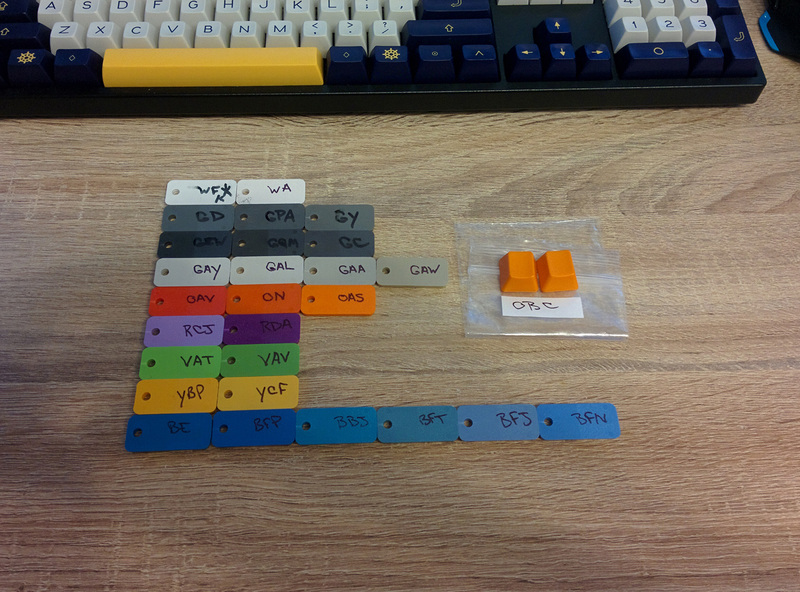 May I suggest adding an Esc and Enter key in ON color with WFM legends to the Monochrome Regular Modifiers kit. This would allow for some nice subtle accents for those who like that. Two additional keys shouldn’t affect the price much either. Just my 2 cents. Not a terrible idea actually, and I can see where you get that from I'll do some mockups and see how it looks. I'm mostly focused on getting the renders done at the moment. Should have something substantial by the weekend (I hope). I would really like to see this make it to GB state. I'm not sure why it hasn't yet though. Seems a real shame MD didn't pick up on it. It's really the first time I've seen multi-color legend options on an SA keyset aside from Penumbra and not including 7bits Round 7 which will take 2 years to complete. I want my multi-color legends. Things take time MD doesn't drop sets right away but spreads them out, they do 1 or 2 sets a month currently from both GMK and SP from what I can tell. The schedule for 2017 is being prepared which I hope Oblivion will be part of. There are other designs that have been floating around longer as well as some re-runs (e.g. SA Carbon Round 2 will happen). It's been exactly two months now since I opened this Interest Check, that's pretty short so far in comparison. Dasher/Dancer is launching in December, 10 months after zslane opened his IC, Chocolatier was 8 months, Godspeed a full year. There is noone who would want this set sooner than I, but in this hobby we have to be very patient! Would it be possible for the alphas to have a smaller font size (like they were on SA retro)? Thank you for you info. It seems there is a long queue waiting for a run. Is this heared from MD? Thanks for the info. Would it actually just be possible to keep an eye on massdrop once in a while through 2017 or are there are place on massdrop where you can actually see the queue? Project page with renders and stuff, also updated first post. All renders were done by myself. 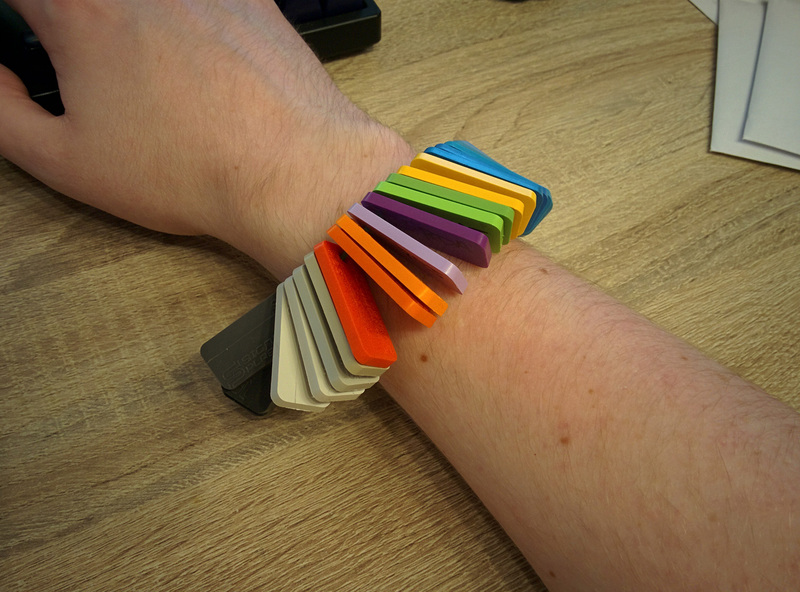 Color chips are somewhere stuck in customs in Germany, should have them soon and be able to finalize the colors when seeing them in real life. I switched the blue tone from BBJ to BFJ for now, wanted something less neon, more calm. Looks amazing. Can't wait for this set. New renders are outstanding, I can't wait to pick up this set for the ErgoDox. Classy set and nice renders! How about Cobalt for the next syntax-highlighting-scheme-inspired keyset? Nice renders! Did you make them yourself from scratch? one of the best renders i've ever seen, too real. I always skip the SA keysets, but this set is too good even i'm a big fan of GMK. truly amazing renders, my hats off to you. This will definitely be something I invest in once the wallet has recovered! The color chips have landed! I will be taking these with me during the holidays and do proper photos with my dad's DSLR and sleep many nights over what chips I will finalize, though the ones I had picked so far are pretty spot on to what I imagined. Also, I would have never thought that i'd be upset about getting keys, I'd much rather have OBC as a chip as well. Gay me up over here! Uh, I don't think this will matter really but I just remembered that the Oblivion theme doesn't actually include the orange color. I changed that myself about a year ago as I wanted if/else/while/for etc to stand out in a different color So it's Oblivion Modified to be precise. Also, I finally got around to sending that email regarding the Git logo permission. I'm out of the office on family leave and am not able to respond to my email. Please contact Karen Sandler (karen@sfconservancy.org) with any urgent items. I wouldn't say this is urgent so I'll update whenever something comes back. Nice one, I'm in for SA with ISO kit. 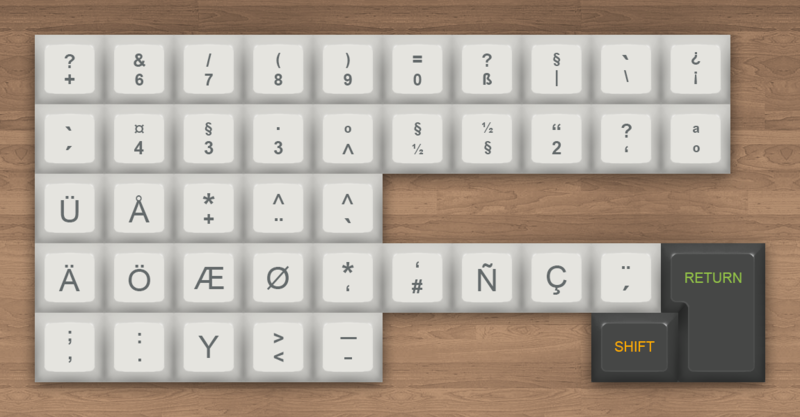 Dasher & Dancer SA is to be delivered in July 2017. I guess we still have a year or two to save up. Signature plastic seriously need to step up their game. This is unacceptable by now. Voted, and I can't wait for this set. The dark set has my name all over it. A couple changes I have made recently, project page is out of date therefor until I have made new renders. 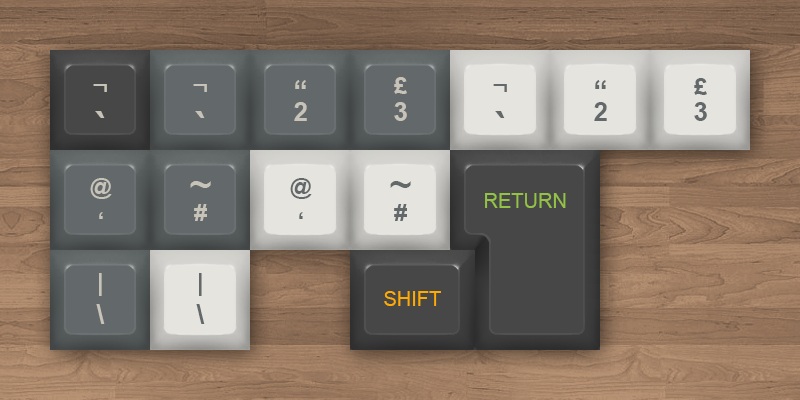 #2 R1 DEL / END / PAGE DOWN have been added to the TKL to support 1800 and 96key layouts, although I feel it would be more appropriate in the Numpad kit as anyone needing these three keys will also have a Numpad, while not everyone getting the TKL will need these as R1, or am I mistaken? Is there any keyboard that does not have a numpad but needs any of these three keys in R1? #4 Let's do Colemak&Dvorak and International in both Quarry and Hagoromo. I believe in you guys! I'm now trying to rework Ergodox a little. People have requested legends on the currently blank keys, will probably have a few variations to pick from in the new year. Edit: Oh, and I wanted to do those mockups with ON colored Enter/Esc keys. 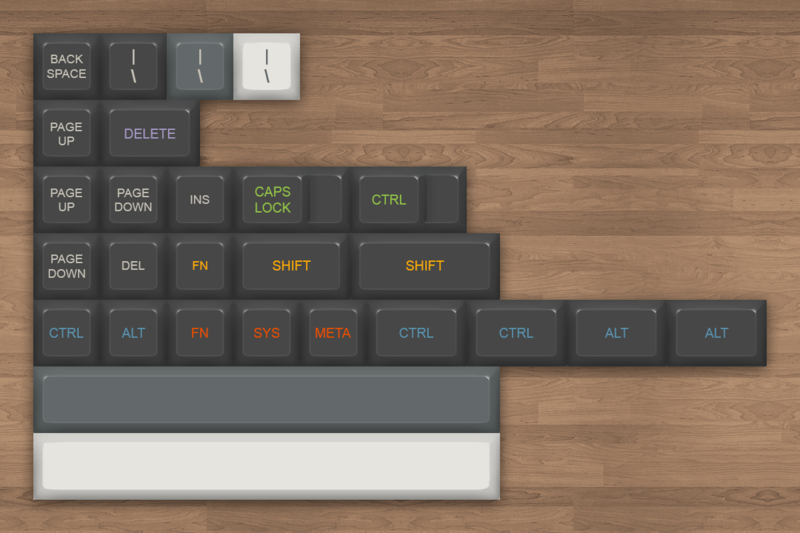 I'm not really into the idea of adding more keys, but I'll at least give it a chance by doing those mockups or even renders. I know this is complex set for ISO, but is there any chance of an ISO enter and shift key with the grey text? It's not necessary, but I do prefer having the R1 DEL for 75%. I like having delete next to backspace . #3 ALT GR has been removed from both UK and International sets in favor of change #4. You lost me there. 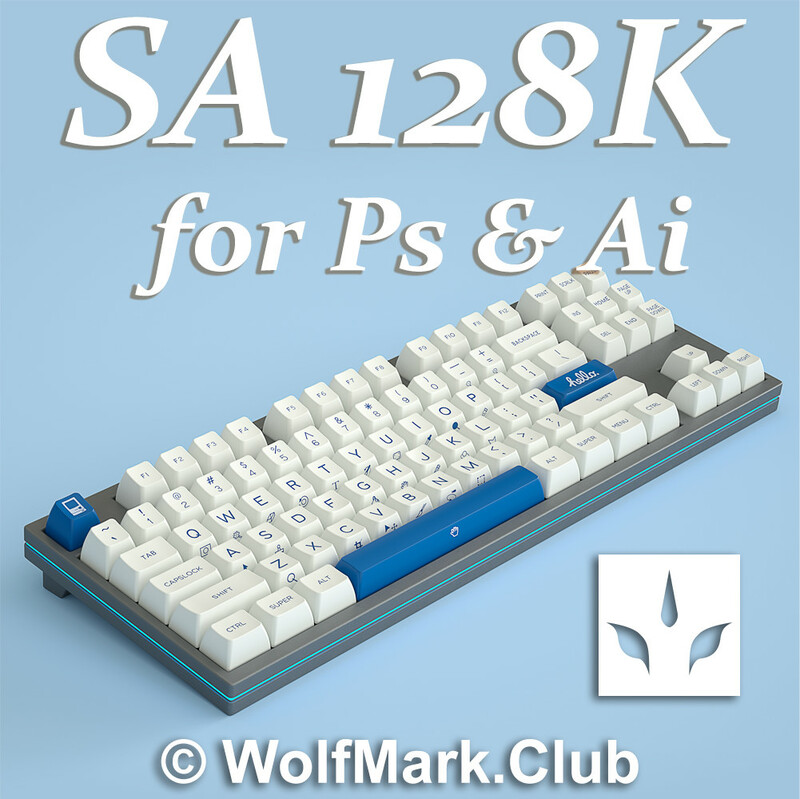 Is there any international (European) layout that will work without AltGr key? Edit: Ah, wait, there are of course the Git keys, Meta and a few more. That'll do I suppose.